Beginning January 9, 2017, join us once a week on Monday afternoons, from 3:30 to 5:00 PM and become a JUNIOR ANIMATOR!This eight (8) week hands-on creativity program will teach young artists (ages 8 - 14) about animation while nurturing the creative thought process and self-expression. Techniques inspired by Chuck Jones are used to teach character development and visual story-telling. No experience necessary. Learn to draw a variety of characters including your own unique character to star in a tale you imagine. Learn how to put your ideas into motion! 9 White Seal: Watch the film, "The White Seal" and learn how to draw Kotick. 16 Bugs Bunny: Watch Chuck drawing Bugs Bunny then draw Bugs yourself. 23 Marvin Martian: Use your imagination to place Marvin in outer space. 30 Character Development: Create a character uniquely your own. 6 Storyboard: Using story arc, imagine and draw a nine-panel comic. 13 Flip-Books: Put your story into motin by sequencing. 20 Cel Animation: Ink and paint a character onto a clear cel. 27 Cel Animation: Paint a background using perspective. Enroll today by clicking here. Author & Illustrator, Kelly Light, to Lead Workshop at the Center! Kelly Light is the author and illustrator of the picture book Louise Loves Art. It is a story about the importance of creativity in all its forms. Louise loves art more than anything; it's her imagination on the outside. She is determined to create a masterpiece—her pièce de résistance! Create your own pièce de résistance on Sunday, March 8 from 3 to 5 PM as author and illustrator Kelly Light leads a one-day only workshop at the Chuck Jones Center for Creativity, 3321 Hyland Ave., Suite A, Costa Mesa, CA 92626. Admission is free and open to the public, but reservations are a must. Call 949-669-7793 x 20107 or email Sasha@ChuckJonesCenter.org for more information and to RSVP. This program is appropriate for ages 7 to 12. Kelly will talk about the connections between cartoons and children’s books. How she used what she learned in animation to write and create characters that may be still on the page, but alive to the reader. How acting with your pencil can put personality into your drawings. Together, doing drawing exercises with character prompts, the children can create a character of their own and a short story board to start them on their own creative journey. Kelly Light also loves art, especially cartoons. Growing up she loved watching cartoons and drawing cartoon characters. She went off to art school determined to start a career in animation which lead to working as a character artist for cartoon licensing. She spent a very long time drawing some of the most beloved cartoon characters, including the characters created by her favorite artist of all time, Chuck Jones. It was a chance meeting with Mr. Jones that sparked the desire to create her characters. Years later, Louise was created and published and is now a seven book series that hopes to inspire kids to be creative and pick up their own pencils and draw out their imaginations. Louise Loves Art will be available for sale that day and Ms. Light has agreed to sign copies purchased at the Center. This Is No "Jump Cut"; Jeff DeGrandis Tells All! "Once the script is written for a film or animation, the next step is to make a storyboard. The storyboard is a series of drawn panels, which visually tells the story of the animation as clear as it possibly can, sort of like a comic book. Though not entirely mandatory, storyboarding is one of those aspects of filmmaking that takes your film from the deep, dank, and dark recesses of your imagination and brings it to life. "The storyboard becomes a visual script, letting you see action of the characters, dialogue, acting, transitions, background layout / locations and camera planning. In my opinion, storyboarding is one of the most exciting parts of producing an animated picture. You’re the cameraman, actor, set designer and planner. As a storyboard artist, you are the first person to visually layout the picture." At the end of the 5 hour session (they did break for lunch in case you were thinking otherwise), everyone left with a new found sense of accomplishment and all were eager to take their new perspective on the importance of storyboarding and apply it to their own projects. Thank you Jeff for your amazing talent! Join us for a storyboarding workshop with Animation Director and Produces, Jeff DeGrandis. Novices to drawing are welcome and more so, encouraged to enroll. Learn what storyboarding is, when to use it, and how. You'll learn how to storyboard your own masterpiece with the guidance from Jeff. "I've always liked cartoons, animation, hot rods, and drag racing. Ed "Big Daddy" Roth was my first great inspiration to draw," says DeGrandis, producer and animator of "Dora the Explorer", "Go Diego, Go!" and other animated series for Nickelodeon. Roth and drag-racing were not the only inspirations for this artist; he adds that Charles Schultz, M.C. Escher, and Tex Avery all have contributed to his style and artistic sensibilities. However, it is to Chuck Jones that he owes his greatest allegiance as a source of inspiration. Jones mentored DeGrandis while he was a student at CalArts in Valencia (formerly Chouinard Art Institute of which Jones was an alumni) and it was Jones who gave him his first job in animation. In a career spanning several decades, he has worked for Chuck Jones Productions, Spumco, Warner Bros., Walt Disney Studios, Universal Studios, DreamWorks, and FOX Kids Network. Married with three "cartoon" kids, DeGrandis hales from New Jersey. In his free time he enjoys watching 50s and 60s television shows and especially early MGM and Warner Bros. cartoons. Santa Ana, CA:oThe Bowers Museum in Santa Ana, California announced today that the exhibition, "Chuck Jones: Drawn from the Far Side", will open on Saturday, April 26 and close August 3, 2014. Celebrated as one of the greatest directors from the "golden age" of animation, Chuck Jones worked in the field some seventy years until his death at eighty‐nine in 2002. His passion for drawing was both work and full time hobby. He drew for a living, and he drew for pleasure and challenge.This exhibit contains original drawings, most never publicly displayed, including a section of 50 so‐called "Doodles," perhaps best described as coming from one artist's very far side. The majority of drawings are from the private collection of Jones' widow, Marian. In collaboration with the non-profit Chuck Jones Center for Creativity. Visit the Bowers Museum website for details. Check out our Girl Scout Programs for Junior and Cadettes! We can also host an Art Program for all age groups! All classes held at the Chuck Jones Center for Creativity, 3321 Hyland, Suite A, Costa Mesa, CA 92626. More information can be found at the websites listed within this email. Or emailsasha@chuckjonescenter.org or call (949) 660-7793 x20107. If you have 6 or more girls in a Troop (or combine Troops), we can schedule a weekday afterschool session. Please inquire within. For centuries, humans have been developing methods to create and bind paper in order to share ideas, knowledge, and inspirations with each other and with future generations. The craft of creating books has evolved over time, but the basic human need to share words and pictures has stayed the same. For this badge, you will try gluing, stitching, and folding your way to shaping your own book artistry style – you’ll create some spectacular gifts and keepsakes. Newspaper cartoons, comic books, graphic novels...comic art is a broad, exciting, and growing field. In this badge, you'll explore the world of visual story telling from career choices to drawing techniques! When you pick up your pencil, anything could leap from your mind onto a sheet of paper. That’s what makes drawing so fun. In this class we’ll show you different techniques to make your drawings even better. Principle 2 - AnticipationJoin us June 15, 2013 at 3:00-6:00PM at the Chuck Jones Center for Creativity for the second principle of animation - ANTICIPATION. Anticipation is used to prepare the audience for an action that is about to occur. It makes the action of a character appear more realistic and helps to ready the audience for the main physical action the character will be doing. It can also be used in your story by setting up a scene with an object that readies an audience for an important moment in a film. 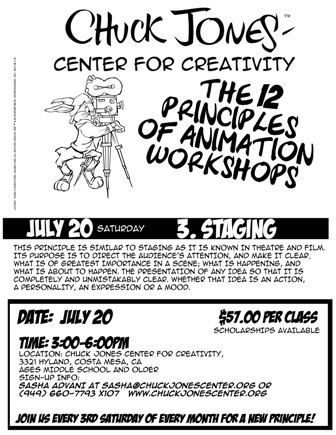 Chuck Jones Center for Creativity and Laguna College of Art & Design to Offer Classes This JulyCosta Mesa, CA: The Chuck Jones Center for Creativity, in collaboration with the Laguna College of Art & Design animation department, is proud to offer its first portfolio development workshop for aspiring animators. This summer, sixteen high school students who are interested in studying the art of animation will have a chance to develop their skills and prepare a portfolio specifically for submission to art schools offering animation programs. This course will be taught by Larissa Marantz, a character designer for Nickelodeon, children’s book illustrator and professor at Laguna College of Art & Design. Participants will learn the basics of character design, appeal, observational drawing, and personality development inspired by the artistic approach of legendary animation director Chuck Jones, who helped create such classic cartoon characters as Bugs Bunny, Daffy Duck, Wile E. Coyote and Pepé Le Pew. Ideal candidates will have had some previous art instruction, but have not had an opportunity to take animated-related classes. The cost of the four-week course is $500 and it will be held at the Chuck Jones Center for Creativity at 3321 Hyland Avenue in Costa Mesa on Mondays through Thursdays 9AM-1PM from July 8th though August 1st. Interested students may contact Lindsay Farr at Laguna College of Art & Design by e-mail (lfarr@lcad.edu) or phone (949-376-6000) to enroll. The principles for creating memorable characters embodied in the work of Chuck Jones remain relevant today whether applied to hand-drawn, computer-generated or stop-motion animation. Young artists definitely won’t want to miss this opportunity to follow in the footsteps of an animation master. About the Center: The Chuck Jones Center for Creativity was founded in 1999 by four-time Academy Award recipient and legendary animation creator and director, Chuck Jones. The Center’s vision is to inspire the innate creative genius within each person that leads to a more joyous, passionate, and harmonious life and world. About Laguna College of Art & Design: Founded in 1961 as the Laguna Beach School of Art, LCAD has grown to include five undergraduate majors and a graduate department. We offer a Bachelor of Fine Arts degree in Drawing and Painting, Illustration, Graphic Design, Animation, and Game Art. The graduate program awards a Master of Fine Arts in Drawing and in Painting. LCAD is one of an elite number of institutions that has both regional accreditation from the Western Association of Schools and Colleges (www.wascweb.org) and national accreditation by the National Association of Schools of Art and Design (www.nasad.arts-accredit.org). We get especially high marks for our use of technology and the liberal arts in the art and design curriculum. Our graduates are career-ready and receive assistance from the Office of Career Services and its many contacts in the art market and industry. Being an hour from Los Angeles puts you close to museums, galleries, the entertainment industry, and graphic design studios. Our faculty includes experienced professionals in their field; all are accomplished educators.